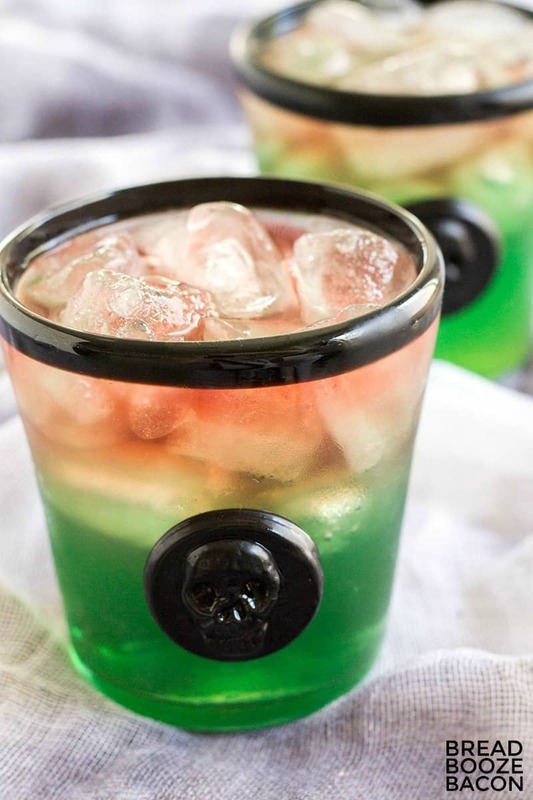 Scare up some fun on Halloween with this frightfully fruity Beetlejuice Cocktail! Made with raspberry liqueur, cranberry juice, and melon liqueur, this spooky Halloween drink will leave your guests wanting more! Beetlejuice, Beetlejuice, Beetlejuice! You know I had to say it, after all, that is the name of this drink! I loved watching Beetlejuice as a kid and now my boys are completely obsessed with it. So you can imagine how super excited I was when I came across this drink. The colors might not look all that enticing, but this sweet and fruity drink it the total opposite of how it looks. 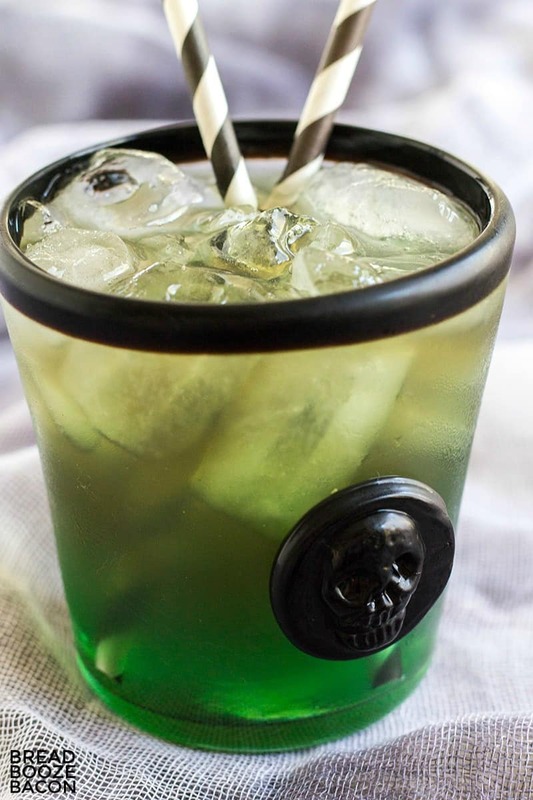 It’s one of my favorite Halloween drinks and cocktails to scare up some fun with all the guys and ghouls! This vodka cocktail is loaded with fruity liqueurs that’ll have everyone asking for another round. 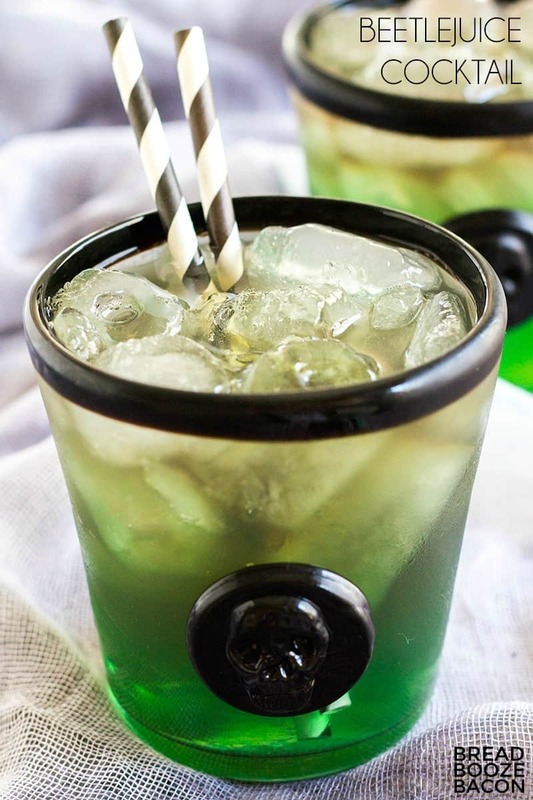 The combination of Midori, Chambord, blue curaçao, and sweet & sour give this drink a gorgeous green color. Then we add some cranberry to mess it all up! If you’re familiar with your color wheel, you’ll remember green and red make brown. 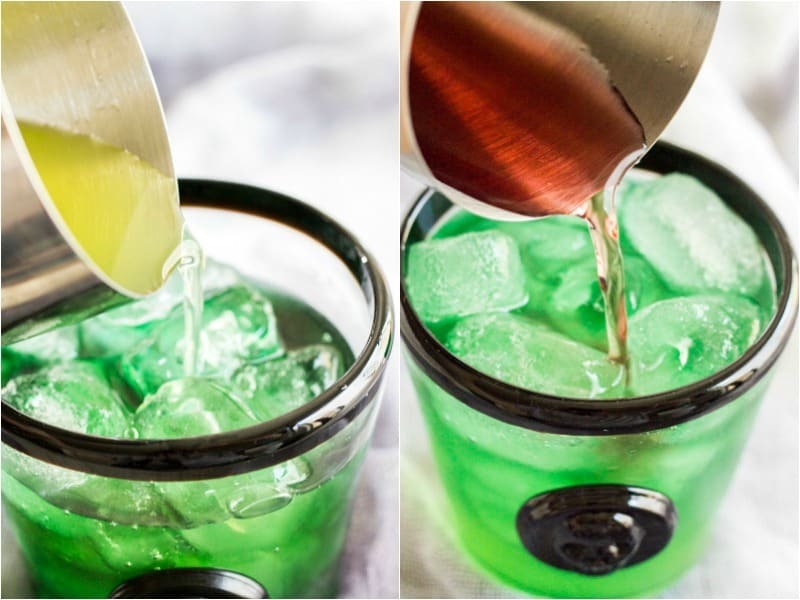 That color combo leaves this drink a creepy greenish-brown color that’s awesome for a Halloween party! Or if you like the layers, float the cranberry juice on top and don’t mix it in. Totally your call. Just be sure to serve this drink with a black & white striped straw…so the sandworms feel the love too. And if you have a glass obsession like I do, snag these Skull Double Old Fashioned Glasses from World Market. 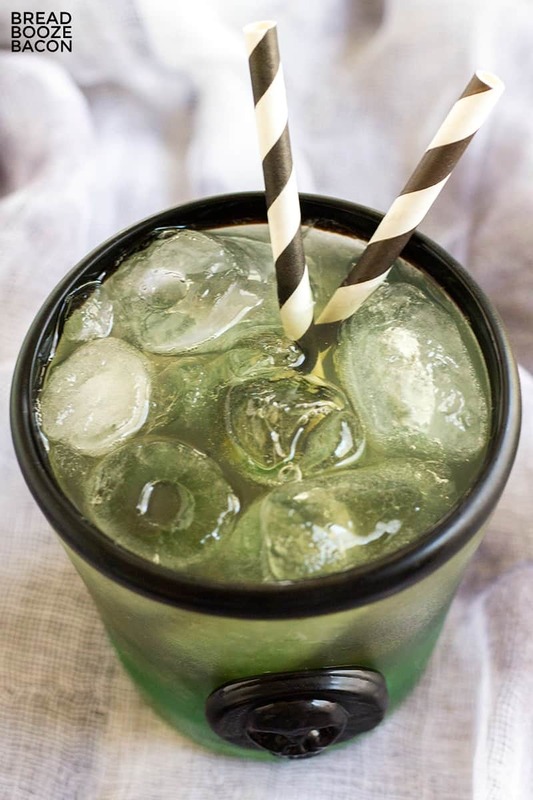 Fill a double old-fashioned glass with ice. To the glass add the vodka, melon liqueur, raspberry liqueur, blue curaçao, and sweet & sour. The drink should be a really pretty green color. Pour the cranberry juice on top of the drink. You can let the juice float or stir it in for a creepy color change. Serve with black & white striped straws and say Beetlejuice! Beetlejuice! Beetlejuice! 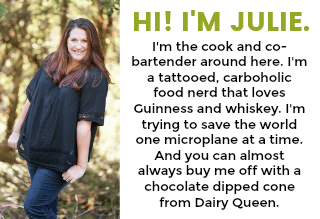 Make this cocktail for a crowd! In a 2 quart pitcher combine 2 cups vodka, 1/2 cup melon liqueur, 1/2 cup raspberry liqueur, 1/2 cup blue curaçao, 2 cups sweet & sour, and 1 1/2 cups cranberry juice. Add ice to chill things down.